The library has a designated ADA computer loaded with accessibility software (see below for list) on the second floor of the library. Patrons who need this computer have priority. For times that the Library is not open please contact the Office of Accessibility Services for other locations of accessibility enabled computer resources and for training and logins for these platforms. Much of this software is supported through CUNY Assistive Technology Services. Patrons should feel free to ask at the Reference Desk or contact us in advance when accommodations are needed—for example, for the physical retrieval of books from our shelves, photocopying, scanning, or individual research assistance in a non-distracted environment. Every effort will be made by the Library to meet such requests expeditiously. A telephone consultation via TTY for hearing or speech impaired patrons can also be arranged. The library can partner with the Office of Accessibility Services to to convert class readings and library research materials into accessible formats - for example, we can bring reserve books or reference books to the Office of Accessibility Services for conversion if necessary. The Office of Accessibility Services works with all students registered as needing accommodation for their class readings which they might acquire directly from the publisher, through Bookshare or the Access Text Network. Open Library/Internet Archives offers many modern texts in copyright through their DAISY/Print Disabled books program; see also Learning Ally and National Library Service (NLS). For accommodation requests and to make an appointment to learn about our accessibility services, please contact our Access Services Library Liaison, Ellen Belcher (ebelcher@jjay.cuny.edu or 212-237-8238), or contact the Reference Desk. We also encourage using reference assistance by email, telephone at (212) 237-8246, chat, or in person, as well as attending our drop-in workshops or making individual appointments with a Reference Librarian for assistance with all of your research and library needs. For elevator access between the Haaren Hall lobby and the floors within the Library, please ask the Circulation Desk (lower floor) or the Reference Desk (upper floor). Members of the John Jay community that regularly need to use the library elevator to between the 10th Avenue entrance and the atrium level should contact Office of Accessibility Services and/or Public Safety to have their ID coded for card access. Elevator access between the floors within the Library does not require Library or Public Safety staff intervention. If you are arranging a pick-up or drop-off, we recommend these addresses for your transportation to avoid barriers due to ongoing construction at the 899 Tenth Avenue entrance. These college entrances connect to the Library entrance via wheelchair-accessible routes. Follow the links above to tutorials for each of these programs. 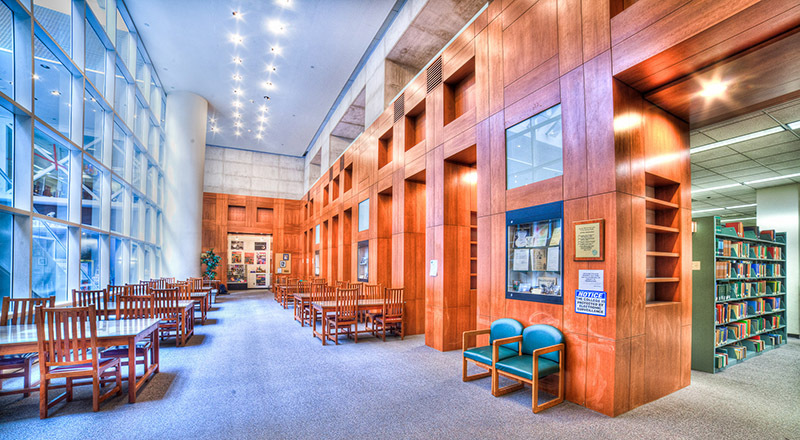 Scanning: Three scanners are located in the Reserve Room downstairs, and four scanners are located upstairs near the Law Reference section (south wing). Email the resulting files, save them to your USB drive, or print them. Make your scanned PDFs full-text searchable (using OCR) at the Accessibility computer located near the scanners upstairs. Open the PDF in Adobe Acrobat and select "Recognize Text » In this file." This will allow your scans to be read by TTS (text-to-speech) software. The Library also has two quite old VTek Voyager XL that still work for enlarging text to any size 4x-60x using a CCTV. More advanced Kurzweil reading software and two more up to date CCTV magnifiers is available at the Accessibility Office. We recommend taking books out of the Library and using their machines for reading enlarged text. Reasonable Accommodations: A Faculty Guide to Teaching College Students with Disabilities.